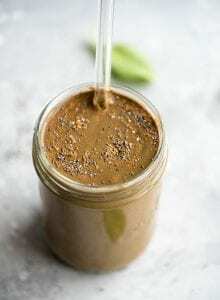 This dreamy chocolate smoothie is full of flavourful, ultra-creamy and loaded with feel-good nutrients such as magnesium. Try it for breakfast, dessert or anytime you need a natural boost in energy. Add all ingredients to a high-speed blender and blend on max for 30-60 seconds until completely smooth and creamy. Pour into a glass and enjoy with a glass or stainless steel straw. For a mocha variation of this smoothie, try it with 3/4 cup coffee and 3/4 cup almond milk. Four Sigmatic Mushroom Coffee would be perfect!